"It's not a building, it's not a sculpture, it's not an artwork, and yet it has scale and relevance to all of those typologies... In a way, we're thinking of this as a piece of furniture. 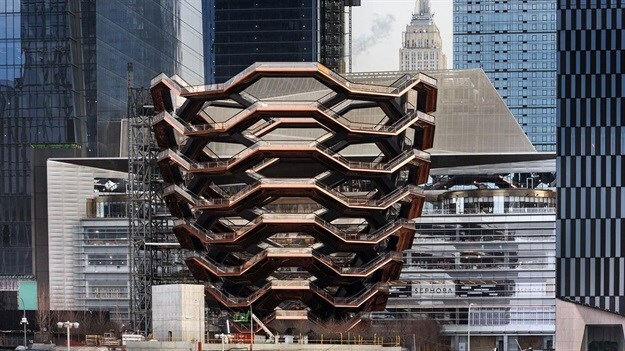 Its ongoing use will evolve, quite naturally," said Stuart Wood, a senior designer at Heatherwick Studio, the design firm behind temporarily named Vessel. The first public pieces of the $200bn mega-project rising on Manhattan’s far west side, Hudson Yards opened to the public this month. Built over the top of a 28-acre rail yard, Hudson Yards is currently the largest private development in the US. 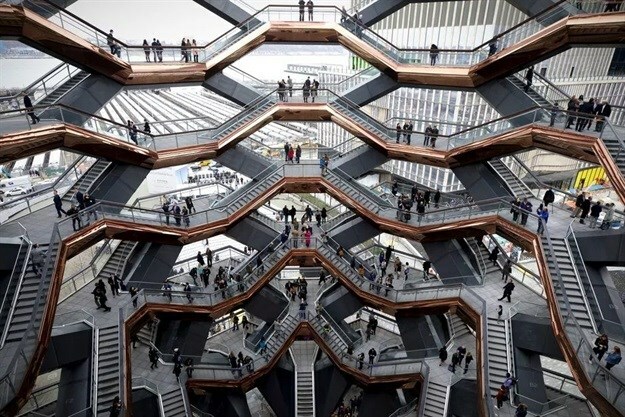 Heatherwick Studio designed a giant honeycomb-like sculpture made up of 154 staircases and 80 platforms, zigzagging together to form a web of nearly 2,500 individual stairs. Vessel’s eight levels are made up of 332,000 square feet of plated steel that stands 194.5 feet above sea level. If you walk up and down Vessel following a circular path, you will walk one mile. "The geometry of the project is quite mesmerising because of its repetitiousness,” said Stuart Wood, “Once you are inside it, it is really calm. You are in the middle of New York, and yet, it is calm." Wood said he believes that although vistas of the Hudson River and parts of the New York skyline are afforded from the structure, the best views are those looking inward. "We have never designed something like this. We will probably never design anything like this again," he added. 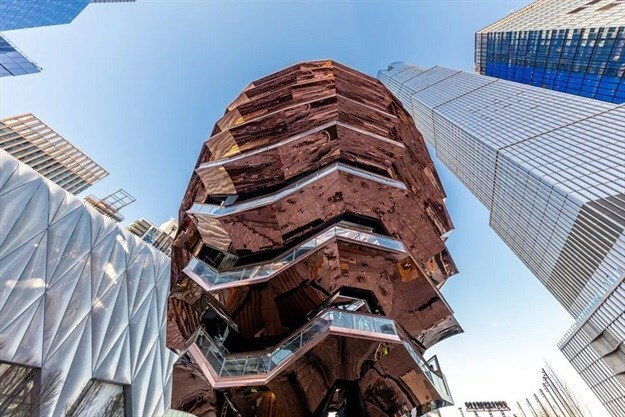 Heatherwick’s design sits at the heart of Hudson Yards, surrounded by glass skyscrapers designed by the firms Kohn Pederson Fox, Skidmore Owings & Merrill, the expandable cultural venue known as The Shed and High-Line by Diller Scofidio + Renfro. Hudson Yards is hoping to attract tourists and locals alike with a shopping mall, restaurants, skyscrapers, and manicured outdoor spaces. The name Vessel is temporary. Visitors are being encouraged to submit ideas for a permanent one from their mobile devices as they exit the structure. Article originally published on World Architecture Community.